My husband loves salt and vinegar chips so I am sure he will love these! I think I’ve fallen in love with the idea…& am I glad you posted these. I have 2 bottles of vinegar crying to be used. I love the salty sour flavour & also love the way these have been done. Great new potato way…thanks a million! Being from Canada I can truly appreciate this post. Salt and vinegar is one of my favorite childhood memories.. chip flavors, on vegetables and lets not forget french fries!! salty hot fries with vinegar drizzled over. I love salt and vinegar. I mean I almost always have a dipping dish of vinegar whenever I eat. Sounds like a great treat! Perfect, I was planning on making a pizza with grilled potatos this weekend, so this will be great guide recipe. I’ll boil them in mostly water though I think, since its for a pizza with other items. This definitely appeals to me. Salty, vinegary, grilled potato slices sounds perfect! Love the pocco pocco picture! 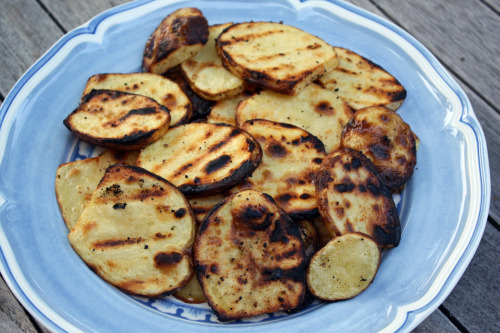 I love vinegar and salt together and these grilled potatoes slices look yummy! Really? You didn’t have salt and vinegar chips there when you were a kid? Who knew! I love salt and vinegar chips (well, crisps here). Really, I love anything with a healthy dose of vinegar. I will be making these! Being from Vancouver Island I love going to Victoria. First time I hear about MacIntoshes Toffee. But we love our salt and vinegar chips here. Growing up I sometimes had to put vinegar on BBQ chips if there was not salt and vinegar chips around. And we love our caramilk & crunchies that you can’t get in the States. Those potatoes looks great. I often do take a recipe page in magazines when I’m in a waiting room. Don’t feel bad :) We are real foodies. It all looks good to me. I just want to know what kind of “fancy finishing salt” you used! I know I should be commenting about the recipe at hand, but I have to tell you, I have those plates (blue plate, top photo)—love their casual elegance! My mouth is puckering up just thinking of these- yum! I love salt & vinegar chips and I remember seeing a recipe for this a while ago and then forgot about it. I’m going to bookmark this so I don’t forget. Yum. I’m with Mark in wanting to know what salt you use. 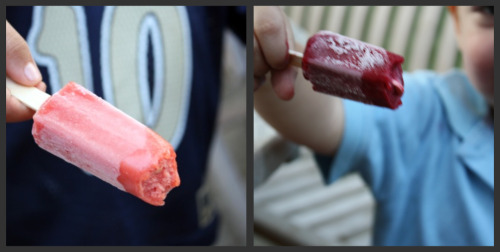 And wouldn’t you know it, we now prefer to call popscicles Pocco-Pocco-Pocco’s, too, thanks to your youngest. So cute! I loooove Victoria. It’s my favourite city. I got to spend a lot of time there as I was growing up because both sets of grandparents lived there. These potato slices sound really intriguing! I’ve never thought of doing such a thing with potatoes.